§ 102-115 Purpose; applicable regulations. § 102-115.1 Modification of regulations for duplexes and apartments. § 102-115.3 Area and bulk requirements for duplexes and apartment houses. § 102-115.4 Permitted zones for restaurants with retail plenary consumption licenses. § 102-116.1 Permitted accessory uses. § 102-118.1 Notification of unsafe conditions. § 102-118.5 Fences and walls. § 102-118.6 Off-street parking requirements. § 102-118.9 Solar energy systems. In order to protect the general health, safety and welfare of Ventnor City residents and in recognition of the high density of development of the City, the following regulations shall apply. All sections of Chapter 102 herein which contained duplexes and apartments as permitted or designated as prior nonconforming structures shall be modified and amended herein. Editor’s Note: Former § 102-115.2, Replacement of existing nonconforming duplexes and apartments, was repealed 4-12-2018 by Ord. No. 2018-07. The minimum lot size shall be 2,000 square feet for duplexes. The minimum lot size shall be 3,125 square feet for two-family dwellings. The minimum lot width shall be 32 feet. The minimum lot width shall be 50 feet for two-family dwellings. The minimum lot depth shall be 62.5 feet. The maximum building coverage shall be 60%. The maximum lot coverage shall be 75%. The front yard shall be a minimum of 10 feet for duplexes. The front yard shall be a minimum of 10 feet for two-family dwellings. The side yard shall be a minimum of four feet on each side for duplexes. The side yard shall be a minimum of five feet on each side for two-family dwellings. The rear yard shall be a minimum of 10 feet on each side for duplexes. The rear yard shall be a minimum of 10 feet on each side for two-family dwellings. The maximum principal building height shall be 35 feet. Off-street parking shall be provided in accordance with the Residential Site Improvement Standards. Parking shall be provided beneath the structure and shall be fully enclosed. The new structure must conform to the minimum flood elevation. Dwellings on lots with frontage on more than one street shall be required to front on the street where the majority of dwellings in the block have frontage. The City Commercial District, but only for properties located within 150 feet of the center line of Ventnor Avenue, Atlantic Avenue or Dorset Avenue. The Commercial/Mixed Use District, but only for properties located within 150 feet of the center line of Ventnor Avenue or Atlantic Avenue. The Design Commercial District, commonly referred to as the "Ventnor Gardens Plaza." However, there is a specific restriction in this district that no restaurant with a plenary retail consumption license shall be located within 2,000 feet of any other restaurant with a plenary retail consumption license located within the City. Automotive salvage yards or outdoor storage of wrecked automobiles or parts thereof. Mobile homes and occupied residential vehicles or trailers. Those parked or stored at private residences must be in rear yards and no closer than five feet from all rear and side property lines. In no case shall they be hooked up to utility service. No such vehicles shall be stored in common parking areas of apartments, high-rises or townhouses. Boats occupied for more than 48 hours, and in no case shall they be hooked up to permanent utility services. Roadside stands or sales from vehicles or vacant lots. Mobile or temporary signs of any kind not specified within district regulations. Any temporary or permanent obstructions at intersections. Any use which includes the storage of gasoline or other petroleum products not permitted in any other section of this chapter. Any use which includes the manufacture or storage of explosives, fat, fertilizer, gas, glue or the reduction of garbage, offal or dead animals. Any use which involves the smelting of tin, copper, zinc or iron ores. Any uses which, by reason of emission of odor, dust, gas, smoke or noise, are detrimental to the health, safety or general welfare of the community. Any use which creates vibration or glare that goes beyond property lines. Establishments intended primarily for patron and/or employee intercept parking and/or the storage or service of fleet or company owned vehicles. All automobile and boat repair shops shall be required to keep all vehicles within their property lines. In no case shall the sidewalk or the right-of-way of any street or alley be used for the storage of these types of vehicles, either under repair or waiting to be repaired. For all single-family lots having frontage along an Environmental District, private boat slips, not for sale or rental, shall be permitted as an accessory use. For lots with more than four proposed boat slips, a minor site plan approval must be obtained. The minimum parking requirements of one off-street on-site parking space/boat slip must be adhered to for the number of slips exceeding four. For all townhome, duplex or other multifamily unit developments having frontage along an Environmental District, private boat slips, not for sale or rental, not to exceed one slip per unit, shall be permitted as an accessory use. For all such projects, a major site plan submission shall be made to the appropriate Board for review and approval. The minimum parking requirement of one off-street on-site parking space per boat slip must be adhered to. Such use shall not be extended or enlarged without conforming to all regulations of the district in which it is located. The existence of a nonconforming use on a part of a lot or tract shall not be construed to establish a nonconforming use on the entire tract or lot. Whenever a nonconforming use is discontinued or changed to a conforming use, it shall not thereafter be changed back to a nonconforming use. Whenever a nonconforming structure has been damaged by fire or other causes to the extent of 75% of its market value, as determined by the Construction Official, it shall be rebuilt or repaired in conformity with the regulations of the district in which it is located. Editor's Note: Former Subsection E, concerning nonconforming uses or structures which cease operations for a period of more than one year, which subsection immediately followed this subsection, was repealed 11-12-1998 by Ord. No. 9824. Eave height is determined by maintaining 5:12 roof pitch from maximum permitted building height. Eave height cannot exceed two feet above the finished floor of the third habitable floor at a point of the exterior wall measured to the top plate of said wall. The minimum required roof pitch in any residential district is 5:12 for all gable and hip roofs. Dormer roofs may be allowed a lesser roof pitch of 3:12 for a shed roof. Dormers must be within the minimum physical setback of the building and not more than 30% in length of the building along each side yard. No dormer shall be permitted to be closer than five feet to the physical building line of the exterior walls below. Dormer faces must be a minimum of 18 inches inside of the wall face below. Dormers shall have a maximum width of 10 feet and shall be spaced a minimum width of five feet in between and be in scale with the roof length. Multiple dormers are encouraged instead of one large dormer. Dormers are permitted to have a shed roof of 3:12. Gable roofs shall have a minimum 4:12 roof pitch. No flat dormer roofs are permitted. Dormers are permitted on a hip roof and shall comply with the same setback requirements unless used as access to a deck. Flat roofs shall be permitted with a maximum building height of 28 feet measured from the location of the finished first floor. See § 102-11, "building height, principal building," and the Flood Damage Prevention Ordinance. A third habitable floor of a flat roof shall be inset an additional five feet from any principal building wall of the floor below. Rooftop decks or a viewing area of any kind above the third habitable floor are prohibited. Editor's Note: See Ch. 126, Flood Hazard Areas. If the Construction Official, upon inspection, determines that an unsafe condition exists with respect to building soundness, fence or wall soundness or sign soundness, he shall notify the owner of his findings and state his reasons and order the condition repaired or removed within a reasonable time period. In all zoning districts with rear yards along mean high water, bulkheads, or wetlands, the rear setback requirement for accessory buildings shall be the same as that required in that zoning district for the principal building. Editor's Note: Former Subsection A, concerning increases in the height limit of buildings, was repealed 5-1-2003 by Ord. No. 2003-2. A public or semipublic building such as a school or church may be erected not to exceed 50 feet in height above elevation 10 mean sea level and to contain not more than 3 1/2 stories, provided that all yards shall be increased one foot for each additional foot of building height in excess of the maximum height permitted. The height of such features shall not exceed 15 feet above the maximum permitted principal building height for the district. The lot area is not more than 10% short of minimum requirements. The lot is not contiguous to any other vacant lot(s) in the same ownership. Minimum setbacks and other requirements of the use are met. As a further exception, there shall be allowed in § 102-22, single-family residence dwellings to be constructed on lots of 4,000 square feet. If said lots were existing at the time of the adoption of this chapter, such construction shall be allowed, provided that all the setbacks required within said district are complied with, and further provided that these undersized lots are not contiguous to any other lot or lots in the same ownership. Editor's Note: Section 1 of this ordinance stated that this subsection was "originally existing within the Ventnor City Development Regulations and omitted in error at the time of printing." Such use will not be enlarged or extended without adequate provision for off-street parking. If, in the event of fire or other causes, the building is damaged to the extent of 65% of its true market value, as determined by the Construction Official, it may be repaired or rebuilt with the same area and bulk but with provision for off-street parking. In the event of either Subsection E(1) or (2) above, the Planning Board may, upon site plan review, extend the permitted height of the structure not to exceed 10 feet in order to provide adequate space for off-street on-site parking. If any building within a commercial district is rebuilt for any reason, the Planning Board may, upon site plan review, increase the permitted height to be increased not more than 10 feet in order to provide adequate room for on-site off-street parking. Notwithstanding other sections of this article, the Planning Board may, upon site plan review of a permitted use in a commercial district, alter yard requirements to encourage unique design or better pedestrian or vehicular access. Such use shall not be enlarged or extended without adequate provision for off-street on-site parking. If, in the event of fire or other causes, the building is damaged to the extent of 65% of its true market value, as determined by the Construction Official, it may be repaired or rebuilt with the same area and bulk but with provision for off-street on-site parking. In the case of either Subsection A or B above, the Planning Board may, upon site plan review, extend the previous height of the structure not to exceed 20 feet in order to provide adequate space for off-street on-site parking. Restoration of existing uses, buildings or structures, nonconforming. For purposes of floodproofing renovations, the finished first floor of any existing nonconforming structure may be increased in elevation without board action, conditioned upon the following: No habitable living space of any kind shall be created below the finished first-floor elevation and this space meets the definition of enclosure, and no building shall be raised more than three feet above the established Federal Emergency Management Agency (FEMA) base flood elevation at the time of construction. The definition of "building height" for purposes of this section shall be modified to permit an increased elevation in height up to but not more than three feet above the base flood elevation. Editor's Note: Former Subsection I, regarding lot size requirements, was repealed 7-18-2002 by Ord. No. 2002-11. For purposes of providing off-street parking and floodproofing of any proposed new single-family, duplex or two-family dwelling structures that conform to all setback regulations, building height may be increased so that the finished first floor is a maximum of nine feet higher than the highest curb elevation along the lot frontage. Building height shall be the vertical distance measured from the finished first-floor elevation to the highest finished surface of the coping for a flat roof, deckline for a mansard roof, or gable for a pitched or hip roof structure. Off-street parking must be provided in accordance with § 102-118.6. Any parking provided within the building envelope and below the first floor must be enclosed within the structure and comply with the definition of enclosure. Steps and stairs to the first habitable floor areas in front yards may not exceed 13 feet in width and must otherwise conform to § 102-118.3B. Roof eaves projections shall be limited to a maximum of 18 inches into any yard. Mechanical equipment (HVAC) may be placed not more than four feet into any already conforming front yard setback or into side and rear setbacks, provided that there is maintained a minimum distance of four feet between the edge of the unit or unit pad and the side or rear property line. If placed within the front yard setback, the units shall be fully buffered with either fencing or sufficient landscaping extending to the top of the mechanical units. No mechanical unit or pad shall exceed 10 feet along any said line. Projections into front yard setbacks by decks and single-story porches shall be limited to five feet, provided that the principal building is currently conforming to the current front yard requirements of the zoning district. Projections by second floor decks and stairs to upper floor areas shall be limited to four feet into the front yard setback, provided that the principal structure is currently conforming to the front yard setbacks of the zoning district. Properties with existing first-floor porches projecting greater than four feet into the front yard setback may have second floor decks constructed over the existing porch, provided that said deck does not extend beyond the limits of the first floor porch footprint. Projections into rear yards by fire escapes shall be limited to six feet. Decks in the rear yard. Decks in the rear yards at a finished elevation no greater than 16 inches above the existing sidewalk elevation in front of said properties shall be no closer than four feet from the rear property line. Porches and decks shall be permitted to extend to the established seawall or bulkhead; however, no porch or deck shall be permitted within the side yard setbacks required in the zone. The decks shall be no higher than the first habitable floor of the dwelling with a railing no higher than 42 inches from said porch or deck. For first habitable story porches and decks, encroachment into the rear yard setback is permitted, providing that the porch/deck width measured from the rear of the dwelling toward the rear lot line is no greater than six feet. A maximum rear yard setback encroachment shall be permitted. A minimum six-foot rear yard setback as measured from the rear lot line is also required. Porches and decks in the rear yard shall be no higher than the first habitable story for dwellings adjacent to Inside Thorofare, West Canal, East Canal and Beach Thorofare. Porches and decks in the rear yard shall be no higher than the first habitable story for dwellings adjacent to the bulkhead or seawall along the Boardwalk and Atlantic Ocean. For dwelling structures raised in accordance with § 102-118.2J, the maximum deck or porch height is nine feet higher than the highest curb elevation along the lot frontage. Bay windows and exterior fireplace/chimney walls shall be permitted to extend not more than three feet into front and rear yard setbacks and two feet into side yard setbacks only when the principal structure is in compliance with current setback requirements of the zoning district. The width of the individual bay window or fireplace/chimney wall, or combination of both in total width, shall not exceed 30% of the total exterior wall width of which they are a part. In garden apartments and townhouses, appropriate facilities for the placing of trash and garbage and the collection and removal thereof shall be constructed separate and apart from dwelling units. Such facilities shall be completely enclosed and so constructed that the trash or garbage shall not be visible to the general public. Such structures shall meet with the approval of the Construction Official and the County Board of Health. No use, principal, conditional or accessory, shall be enlarged or extended beyond the level existing at the time of the passage of this chapter without adequate provision for off-street parking. All mechanical service shall take place within fully enclosed structures. All sales, with the exception of boat sales, shall take place within fully enclosed structures. All state and federal requirements pertaining to land and business shall be met. Boats shall be organized in orderly rows with sufficient aisles, subject to Ventnor Fire Department review and approval, to permit proper access. The outdoor area is maintained. Boat storage on contiguous parcels may be permitted, subject to Planning Board approval. Gasoline sales for boats only shall be permitted, subject to Ventnor Fire Department review and approval. Lands within the Conservation District or lands which are found to be wetlands shall not be used to calculate lot area or as a part of permitted density calculations unless specifically approved by the Planning Board. Be completely enclosed and so constructed that the trash and garbage shall not be visible to the general public. Be aesthetically designed to fit within the overall project design. Be buffered from principal structures, parking facilities and pedestrian and vehicular roadways. Be designed so as to be readily accessible to users. Meet the approval of the City Construction Official and the County Board of Health. Any use involving a plenary retail distribution license for permitted sale of alcoholic beverages shall have direct access solely from a public street and shall not have any access to or be part of any other access to any other use within the existing or adjacent building floor levels. No other use within the same or adjacent buildings shall be permitted to have access through, or part of any direct access to, any use involving the plenary retail distribution license for permitted sale of alcoholic beverages. Wireless communications facilities, including towers, electronic equipment and/or transmitting/receiving antennas, shall be permitted in any zoning district only upon lands owned by the City of Ventnor City or unimproved roadway rights-of-way and subject to municipal approval, bid and lease with the governing body. Steps or stairs from first floor decks or porches not higher than the one-hundred-year base flood elevation as determined by the Federal Emergency Management Agency for that zone shall be permitted to extend from the deck or principal structure to the front property line. The exterior width of the steps, including support foundation and planters, shall not, at any point, be wider than eight feet when constructed within the front yard setback. The maximum finished elevation of the steps within the front yard at the property line shall not be greater than four inches (0.33 feet) above the top of the curbing immediately in front of the proposed steps. Aboveground oil tanks are permitted to be installed in the rear yard area of the property as defined by the Construction Code Official, provided that the tank is placed immediately adjacent to the principal structure and results in an overall reduction of the district conforming rear yard principal building setback by not more than 36 inches. Tanks are permitted in the side yards, provided that they meet the district principal building side yard setback requirements for the zoning district. No aboveground tanks are permitted between the principal structure and any street. No top of any tank shall be permitted to be set higher than six feet above existing grade, and the tank must be placed on a concrete pad not less than six inches in thickness. Electric vehicle charging stations owned or leased by the City of Ventnor for public use as well as private EVSE shall be permitted as an accessory use in all zoning districts excepting the Environmental District. No owner or developer of a property in Ventnor City shall install private electric vehicle supply equipment in or adjacent to a vehicle right-of-way in such a way that the private electric vehicle supply equipment is to be used from a vehicle parked in a public right-of-way and/or on-street parking space. The City of Ventnor is authorized pursuant to Chapter 217 of the City Ordinances, as amended, to designate on-street parking spaces for electric vehicle charging. All areas not covered by roadways, parking areas, impervious walkway areas or buildings shall be landscaped with natural indigenous living landscaping materials. Native coastal vegetation should be utilized to the extent possible. A landscaping plan shall be submitted when landscaping is required in accordance with this section, indicating location, types, sizes and number of all landscaping materials to be installed. All landscaped areas shall be maintained regularly and replaced as needed. A schedule for maintenance, including specifications, methods and procedures to be utilized, shall be submitted with the landscaping plan submitted as a part of the site plan application. Privacy walls not to exceed five feet in height are permitted when designed in conjunction with berms and landscaping, pursuant to the rules and regulations of this article. All landscaping in parking areas shall be carefully located so as not to obstruct vision. Clear sight shall be provided at all street intersections and comply with the American Association of State Highway Transportation Officials (AASHTO), "A Policy on Geometric Design of Highways and Streets 2011, 6th Edition." Landscaping materials should conform to the Plant Species List - Appendix A to the maximum extent practicable, included as an attachment to this chapter. Editor's Note: A copy of the Plant Species List—Appendix A is available in the City Clerk's office. Deciduous and street trees shall have a caliper of at least two inches and be eight feet to 10 feet in height at planting, and evergreen trees shall be at least six feet tall unless otherwise specified. All trees shall be balled and burlapped and be of specimen quality as established by the American Association of Nurserymen. Plantings should be consistent with the "Tree Plan for Ventnor City dated August 2014." A "governor's strip" shall be optional. If a governor strip is installed it shall be of pervious material and maintained between the sidewalk line and the curbline. All development shall provide this grass strip if previously removed. If front street trees are placed in the curb strip, the cut-out for the trees shall be a minimum of three feet wide by the width of the strip. The minimum width of the "governor's strip" shall be three feet or match that width of any existing abutting grass strips, if wider. Any landscaping which, within two years of planting, dies for any reason shall be replaced by the developer(s) or by the current owner at their sole expense. Impervious materials shall not be used in any landscape area. Weed-retardant mulch, porous nonwoven synthetic landscape fabric or other materials may be used. Vegetative ground cover is encouraged. Stone mulch may be used in landscaping beds if less than 10% of the required front landscaping area and not more than 10% of the total lot landscaping. Any new plantings of bamboo are prohibited. For existing bamboo plantings, the homeowner is responsible for growth that may intrude into the neighbor's property or harm or destroy the neighbor's structures or site improvements. Code Enforcement may require complete or partial removal of all bamboo stands if the intrusion recurs or harm/destruction occurs. Landscaping shall be located to provide for climate control. Landscaping shall be used to accent and complement buildings. Landscaping shall be provided in public areas, parking areas, recreation sites and adjacent to buildings. Vines and climbing plants may be considered for large expanses of wall. Massing trees may be considered at critical points. Smaller trees shall be used on narrow streets. Ground cover shall be used to prevent erosion. A variety and mixture of landscaping shall be provided. Consideration shall be given to susceptibility to disease, colors, season, textures, shapes, blossom and foliage in selecting species. Local soil conditions and water availability shall be considered in the choice of landscaping. Existing trees located within 10 feet of any street right-of-way shall be maintained unless shown to be removed as part of an approved plan. The existing grade within that space shall not be disturbed without such approval. The impact of any proposed landscaping plan at various time intervals shall be considered. Shrubs may grow and eventually block sight distances. Foundation plants may block out buildings. Existing large trees (more than six-inch caliper) shall be saved by not varying the grade around the trees by more than six to 12 inches, by construction of tree wells and by erecting protective fences. Trees. The planting of trees is optional. Two trees may be planted per frontage. For multifamily dwellings, one tree per unit may be planted. For duplex and two-family units, two trees may be planted per frontage. A suggested list of tree species is detailed in the Plant Species List - Appendix A. Trees shall be located only in the front of the house and shall be no closer than 25 feet to the street corners and comply with AASHTO sight requirements. Yards. All residential lots shall have a minimum of 25% of the lot area landscaped, of which, 5% of the lot area must be provided in the front yard. All areas not occupied by buildings, parking areas, patios, walkways and/or any other impervious surface shall be suitably landscaped. No landscaping shall interfere with required AASHTO sight requirements. Such landscaping minimum of 25% may be reduced to the minimum extent required to accommodate stairs, steps, ADA-compliant ramps and related elements providing access to the first floor necessary to conform to the lowest floor requirements. In no case, however, shall such percentage be lower than 20% of the lot. Grass or other natural ground cover may be used. Use of natural ground cover material other than sod shall be permitted. Minimum spacing at time of planting shall be six inches on center. The number of shrubs required for each property shall be governed by lot width which shall require one shrub for every two feet of lot width. Fifty percent of the total number of shrubs shall be planted in the front of the property with the balance on the sides and in the back. A property owner may reduce the number of shrubs set forth in Subsection (M)(3)(a) above by planting a tree. For each tree planted, the amount of shrubs may be reduced by two shrubs from the total number of lot width. A property owner may reduce the number of shrubs set forth in Subsection (M)(3)(a) above by planting a governor's strip. If the party plants a governor's strip, three shrubs may be reduced from the total number required for the lot width. The plantings between the principal structure and the front property line detailed herein may be reduced to the minimum extent required to accommodate stairs, steps, ADA-compliant ramps and related elements providing access to the first floor necessary to conform to the lowest floor requirements. Buffers. In townhouses, garden apartments and high-rise developments, there shall be a perimeter buffer of eight feet and a similar buffer between parking areas and all streets. Such buffers shall consist of natural landscaping materials, i.e., cedar or similar wood, and shall include both ground cover and alternating rows of evergreen of at least four feet in height and spaced not greater than eight feet apart in each row, when planted, except within 10 feet of street corners where evergreens of not more than three feet in height shall be planted. Parking areas. Common parking areas provided for residential areas shall be landscaped. Buffer areas of four feet minimum width shall be provided along the perimeter of said parking areas and shall consist of an effective combination of ground sculpturing and berms, trees, ground cover and shrubbery. At least 10% to 15% of common parking areas shall be landscaped, and a minimum of one tree with a minimum caliper of three inches for each five parking spaces shall be provided. The landscaping shall be located along walkways, in center islands and in all irregularly shaped areas not used for parking and shall be bordered by brick, Belgian block or other natural materials and shall be carefully located so as not to obstruct vision. Trees. A minimum of two trees per each dwelling unit and commercial or office establishment shall be planted. An effective tree planting program shall be provided in all plazas and public areas contained within the center. Tree grates shall be provided for all trees located in paved or textured areas. Parking areas. Common parking areas provided for the center shall be landscaped. Buffer areas of four feet minimum width shall be provided along the perimeter of said parking areas and shall consist of an effective combination of ground sculpturing and berms, trees, ground cover and shrubbery. Breaks for pedestrian access may be located in said buffer, provided that the accessway is surfaced with brick, Belgian block or other paving block materials and shall not exceed six feet in width. At least 10% to 15% of common parking areas shall be landscaped, and a minimum of one tree for each five parking spaces shall be provided. The landscaping shall be located along walkways, in center islands and in all irregularly shaped areas not used for parking and shall be bordered by brick, Belgian block or other natural materials and shall be carefully located so as not to obstruct vision. Shrubs. Each lot's open space not covered with permissible impervious lot coverage or building coverage shall be completely landscaped with evergreen and deciduous shrubs indigenous to the area. Every effort should be made to create a natural landscaping environment with the impression of completeness at the time of planting. All deciduous shrubs shall be a minimum of three feet to 3 1/2 feet in height at time of planting. Large evergreen shrubs for hedge planting shall be 2 1/2 feet to three feet in height at time of planting, and small evergreen shrubs shall be 18 inches to 24 inches in height at the time of planting. The number of shrubs for each property shall be governed by the lot width which shall require one shrub for each two feet of lot width. A property owner may reduce the number of shrubs set forth in Subsection (N)(3)(a) above by planting a tree. For each tree planted, the amount of shrubs may be reduced by two shrubs from the total number of lot width. A property owner may reduce the number of shrubs set forth in Subsection (N)(3)(a) above by planting a governor's strip. If the party plants a governor's strip, three shrubs may be reduced from the total number required for the lot width. Trees. A minimum of one tree for each two dwelling units shall be planted. Buffers. For senior citizen housing, buffers shall be provided along parking areas at a minimum of four feet wide, consisting of evergreen trees and deciduous plants and shrubs. Perimeter buffers shall be eight feet wide and shall consist of evergreen trees of four feet minimum height at time of planting placed six feet apart with smaller plant material in between. Parking areas. For senior citizen housing, landscaping shall be located along walkways, in center islands and in all irregular spaces not used for parking. All landscaping shall be bordered by natural materials and maintained regularly. Two trees for each 1,000 square feet of floor area in accordance with the planting schedule. Where a commercial district use abuts a residential area, a three-foot buffer of evergreen trees, a minimum of four feet in height at planting, five feet apart, shall be provided. In a Design Commercial District, all perimeter setbacks shall have a buffer strip eight feet wide, consisting of trees of a minimum height of eight feet at planting, placed in double alternating rows, eight feet on center in each row, with smaller evergreens or deciduous plant material in between. The only exception to this requirement shall be ingress and egress lanes and five feet to each side of such lanes. In an open parking lot for more than 100 cars, an internal planted buffer of four feet shall be provided every 70 feet. This buffer shall be planted with trees, evergreens and deciduous plant material. Street trees may be required to substitute for on-site planting where it is determined by the Planning Board, Zoning or Construction Official to be more desirable or necessary as a result of inadequate on-site area for installation, in which case trees shall be set back 36 inches from the curbline and shall be spaced 12 feet apart. The area immediately surrounding the tree base shall be covered with paving bricks or other natural porous material. The Planning Board may change this requirement to a different planting requirement during site plan review if adequate pedestrian clearance results. Unless otherwise regulated by this section, all conditional uses shall be required to provide side and rear yard buffer strips that consist of evergreen trees of a minimum height of four feet at planting, placed in double alternating rows, eight feet on center in each row, with smaller evergreens or deciduous plant material in between. For any property owner who is raising their home to meet the necessary flood elevation requirements, they shall be given 24 months in which to complete their landscaping plan that was approved pursuant to their permits or Planning or Zoning Board decision and resolution. Upon the conclusion of the 24 months, property owners shall be required to complete their plan, failure to do so will result in a written warning providing 30 days' notice to correct the violation. Failure to abide the thirty-day notice, the City of Ventnor shall have the right to file an ordinance violation against the property owner. Any violation of this provision of this section shall be subject to prosecution in the Ventnor City Municipal Court and shall be subject to a fine for the first violation in the amount of $100 and thereafter for each additional violation up to $1000. Fences and walls shall be permitted subject to compliance with regulations provided in this section. Fences and walls shall be designed and placed so as to avoid any adverse impacts upon adjoining properties, including but not limited to shading, blockage of ventilation or blockage of views and vistas of open space areas. The maximum height of any fence shall not exceed four feet within the minimum front yard setback established by the zoning district and shall be constructed with a minimum 50% open area between posts. Fencing within the front yard setback not having a fifty-percent open area between posts shall conform to the front yard height restrictions for walls. The height of fencing within the side and rear setback areas shall be not greater than six feet with no minimum open area requirement. Walls shall not exceed a height of three feet in the front yard setback area and five feet in side or rear setback areas. Fence posts and wall pilasters shall be limited to a width of 12 inches along the fence line with a spacing between edges of posts or pilasters of not less than six feet. Fence post and pilaster caps shall be permitted to extend not more than six inches above the respective fence/wall height requirement and shall not be greater than 12 inches in width. The height of any fence or wall shall be measured from the sidewalk or top of curb grade for front yards and adjoining property existing ground elevation for side and rear yards. An exception to six-foot-high fencing within the front yard setback is hereby established for corner lots in the R-2 Zoning District only. 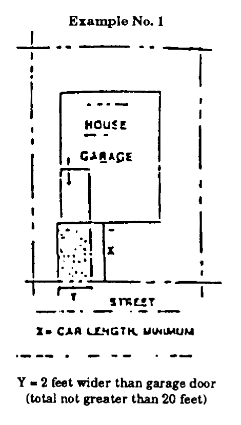 Only lots in that district which have frontage on two streets (corner lots) may erect six-foot-high fencing meeting the open-air and post requirement of this section along the full length of the property line along the rear yard, as determined by the Construction Code Official, and along only one of the front property lines at a setback of 1/2 the front yard setback requirement for that district for a distance not more than 25 feet from the rear property line. Six-foot-high fencing not meeting the fifty-percent open-air requirement shall install at the time of fence installation a minimum four-foot-wide planting bed adjacent to the fence and along the entire front yard fence facing the street. Shrubbery shall be installed in said planting bed that is not deciduous and does not exceed the height of the fencing nor extend beyond the limits of the planting bed. Shrubbery shall be placed at a minimum of four feet on center and have an initial height of four feet. The property owner shall be required to perpetually maintain the shrubbery such that it does not exceed the height of the six-foot fence or extend beyond the limits of the planting bed. All fencing and walls, including the foundations, shall be constructed within the established property lines. No fencing shall be permitted within 10 feet from the face of the existing curb at street intersections. Fencing shall be designed and placed to avoid obstruction and growth of required landscaping. New developments shall provide landscaping or walls of material construction which is compatible with the overall project design. Fences and walls shall not be permitted when the resulting clear width between the fence or wall and the principal structure is less than three feet. Said clear width area shall only apply to the areas from existing, or finished, grade level to a clear height of not less than seven feet. All permitted fences shall be situated on a lot in such a manner that the finished side shall face adjacent properties. No such fence shall be erected of barbed wire, topped with metal spikes or constructed of any materials or in any manner which may be dangerous to persons or animals. An in-ground private residential swimming pool area must be surrounded by a fence at least four feet, but not more than six feet, in height. Fences six feet in height are permitted in side and rear yard areas only. Fences or any portions thereof in excess of six feet are specifically prohibited. A tennis court area, located in side or rear yard areas only, may be surrounded by a fence a maximum of 10 feet in height. The fence shall be set back from any lot line the distance required for accessory buildings in the district in which the fence is to be located. Construction. All concrete oceanfront seawall construction and/or reconstruction between Jackson and Richards Avenues shall remain within the property lines of the adjacent upland property owner and not within the area defined as the public park within the park deed on file in the Municipal Clerk's office. All timber oceanfront bulkheads between Richards and Fredericksburg Avenues shall be replaced and/or reconstructed in line with, or oceanward of, the existing timber bulkhead line, but in no case greater than 3 1/2 feet oceanward of the adjacent upland property line, which distance shall be measured to the face of the new bulkhead sheeting. Construction and/or reconstruction of concrete and/or timber bulkheads shall be of the same type of material as originally existing and in conformance with City engineering details on file with the Municipal Construction Code Official. Timber oceanfront bulkheads may be replaced with concrete oceanfront seawalls. Construction and/or modifications to the existing oceanfront seawalls and timber oceanfront bulkheads shall be subject to approval by the Municipal Construction Code Official through the building permit procedure. Any requests for variations or modifications due to proposed architectural features shall be first reviewed and approved by the City Commission. Height. Minimum height shall be elevation 10.5 (NAVD88). No concrete oceanfront seawall cap or timber oceanfront bulkhead cap, sheeting and/or piling shall be constructed with a finished elevation higher than the highest elevation of the existing boardwalk decking within the area projected by the extension of the property lines to the boardwalk. No fencing or any other material construction will be permitted on or over any concrete oceanfront seawall or timber oceanfront bulkhead. Any fencing shall be placed along the property line only. For a concrete oceanfront seawall, the fence shall be placed on the landward side of the concrete seawall construction. All fencing shall be constructed independent of the seawall/bulkhead construction. No fencing shall be constructed higher than the existing boardwalk railing, but in no case higher than 48 inches above the height of the oceanfront seawall or bulkhead. Construction. All bayfront bulkhead construction or replacement shall be within the established riparian rights of the upland property owner. No construction permit shall be issued by the Construction Code Official without proper approval of the State of New Jersey and Army Corps of Engineers. Bulkhead material shall be limited to wood (creosote or cca) and designed in conformance with standard engineering construction as approved by the Construction Code Official. Construction or modifications to the bayfront bulkheads shall be subject to approval by the Municipal Construction Code Official through the building permit procedure. Height. Minimum height shall be elevation 8.0 (NAVD88). Maximum height shall be elevation 9.00 (NAVD88). No bayfront bulkhead shall be constructed higher than elevation 9 USCG. Fencing to a height of not more than four feet shall be permitted above the highest permitted elevation of the bayfront bulkhead regardless of consideration of whether it is the front, side or rear yard. Fencing shall be permitted to extend from property line to property line along the bayfront bulkhead. All private bulkheads within the City of Ventnor must be maintained in such a manner so that the same are not injurious or dangerous to the health, safety or welfare of the citizens of, or visitors to, Ventnor. Said bulkheads shall be kept in such a state of repair so as to maintain the land in and around said bulkhead to a grade above the mean high tide level as established for the City of Ventnor. Said bulkheads shall be maintained to prevent erosion of any upland dirt, sand or other material from the property on which the bulkhead is situated or any neighboring or adjoining properties. Additionally, no zoning permit, certificate of occupancy or certificate of land use shall be issued for any vacant lot which does not have a bulkhead or does not have a bulkhead which is in conformity with this chapter. For any sale of a lot without a conforming bulkhead, if the responsibility to construct the bulkhead is placed on the buyer, a certificate of land use may be issued, in the discretion of the Construction Official, upon the submission of a bond in favor of the City of Ventnor in an amount equal to 110% of the cost to construct the bulkhead and a written agreement between the buyer and seller clearly stating the responsibility to construct the bulkhead is placed on the buyer. In such event, the bulkhead must be constructed within 12 months of the date of sale or the City of Ventnor shall have the absolute right to call said bond and be allowed access to the property to construct said bulkhead. Any person or entity who violates this section of the Code of the City of Ventnor may be subject to a fine not to exceed $1,250, may be ordered to perform community service for up to 30 days, and may be subject to jail time not to exceed 90 days, all in the discretion of the Municipal Court Judge of the City of Ventnor. An adequate number of off-street parking spaces shall be required in all developments to accommodate residents and visitors. For residential developments, off-street parking shall be provided as set forth in Table 1. When determination of the number of parking spaces required by this exhibit results in a requirement of a fractional space, any fraction of 1/2 or less may be disregarded, while a fraction in excess of 1/2 shall be counted as one parking space. Requirements for attached units include provision for guest parking. For high-rise buildings, parking stalls with electric vehicle supply equipment shall be provided at a rate of one EVSE per 20 stalls. The provision of EVSE for single-family detached units, duplexes, garden apartments, and townhouses shall be at the discretion of property owners. Each EVSE-capable stall counts as 1.5 parking spaces towards the requirement. For nonresidential developments, the parking standards shown in Table 2 shall be the minimum requirement. Alternative off-street parking standards to those shown in Subsections A(2) and (3) shall be accepted if the applicant demonstrates that these standards better reflect anticipated conditions. This may include factors affecting minimum number of parking spaces, including household characteristics, availability of mass transit, urban versus suburban location, and available parking resources such as on-street parking. A one-car garage and driveway combination shall count as 1.75 off-street parking spaces, provided that the driveway measures a minimum of 25 feet in length between the face of the garage door and the sidewalk or 30 feet to the curbline. A two-car garage and driveway combination shall count as 3.5 off-street parking spaces, provided that the minimum width of the driveway is 20 feet and its minimum length is as specified above for a one-car garage. For mixed-use developments, a shared parking approach to the provision of off-street parking shall be permitted following the methodology described in the publication Shared Parking, Urban Land Institute and Barton Aschman Associates, Inc., Urban Land Institute, 1984. The site plan shall clearly indicate both that portion of the parking area to be initially paved and the total parking needed to provide the number of spaces required. The site plan shall provide for adequate drainage of both the partial and total parking areas. The portion of the parking area not to be paved initially shall be landscaped. The applicant shall post separate performance guaranties, in addition to the performance guaranties, which shall reflect the cost of installing the additional parking facilities necessary to provide the total number of parking spaces required. In lieu of a permanent certificate of occupancy, a temporary certificate of occupancy shall be issued for a period of two years. Prior to the expiration of the two-year period, the applicant may either install the additional parking shown on the site plan and apply for issuance of a permanent certificate of occupancy or apply to the Planning Board after the use has been in operation a minimum of 18 months for a determination as to whether or not the initial parking area provided is adequate. If the Planning Board determines that the parking facility is adequate as originally constructed, the performance guaranty shall be released and a permanent certificate of occupancy issued. If, however, the Planning Board determines that the partial off-street parking area is not adequate, the applicant shall be required to install the additional parking facilities in accordance with the terms of the performance guaranties prior to the issuance of a permanent certificate of occupancy. Any change of use on a site for which the Planning Board may have approved a partial paving of off-street parking areas to a use which requires more parking spaces than are provided on the site shall require submission of a new site plan. Where an applicant proposes fewer parking spaces for a use other than is required by this section, the Planning Board or Zoning Board of Adjustment will require posting of a contribution for development of parking facilities. The fee per required space or fraction thereof shall be established by the City Engineer, considering actual cost estimates to develop a reasonable parking plan within 1,000 feet of the development site. The cost will include estimated acquisition of land, demolition of buildings, improvement with parking, lighting and landscaping and other site features. A reasonable annual maintenance fee may be assessed. The plan shall be in place before approval is granted and contributions are required prior to issuing construction permits. If contributions for parking are not used for the purpose intended within two years of the date of approval, the funds shall be returned to the applicant with any interest accrued. Off-street parking stalls with electric vehicle supply equipment shall be provided at a rate of one EVSE per 20 stalls. The provision of EVSE for single-family detached units, duplexes, garden apartments, and townhouses shall be at the discretion of property owners. Each EVSE-capable stall counts as 1.5 parking spaces towards the requirement. For nonresidential uses (excluding commercial/residential mixed use), off-street parking spaces with EVSE shall be provided at a minimum rate of one EVSE per 20 stalls. If fewer than 20 stalls are required, the provision of off-street EVSE is encouraged and shall count as 1.5 parking spaces towards the parking requirement. Size of spaces. Each off-street parking space shall comply with the dimensions established in the definition of parking space. Off-street parking areas shall be oriented to and within a reasonable walking distance of the buildings they are designed to serve (a maximum of 1,000 feet for employee parking; 500 to 800 feet for shoppers; 250 feet for nonelderly residents; 150 feet for elderly residents; and 300 feet for guests). Access to parking lots shall be designed so as not to obstruct the free flow of traffic. There shall be adequate provision for ingress to and egress from all parking spaces to ensure ease of mobility, ample clearance and safety of vehicles and pedestrians. The width of all aisles providing direct access to individual parking stalls shall be in accordance with the requirements specified below. Only one-way traffic shall be permitted in aisles serving single-row parking spaces placed at an angle other than 90°. Parking areas shall be suitably landscaped to minimize noise, glare and other nuisance characteristics as well as to enhance the environment and ecology of the site and surrounding area. Large parking lots shall be broken down into sections according to type and size of development and separated from other sections by landscaped dividing strips, berms and similar elements. Location of spaces on residential lots. For dwelling units with garages which face the front property line, off-street parking may be allowed within the front setback, provided that the space is sufficient to park a vehicle perpendicular to the street without overhanging the front lot line. (See Example No. 1 below.) The front setback driveway width shall be limited to the width of the garage door opening, plus two feet. For corner lots, the rear lot line shall be considered as the side lot line, and both yards facing the street shall be considered as front yards. Thus, no off-street parking shall be allowed in the area bounded by the street lot lines and the building lines projected forward to the street lines for dwellings without garages (see Example No. 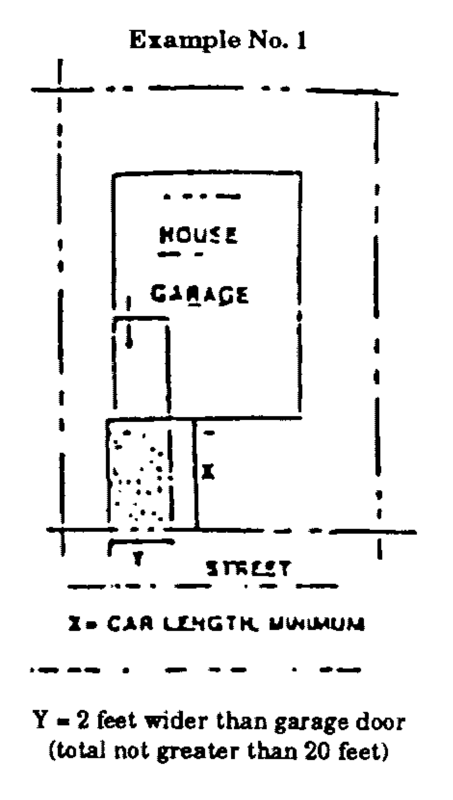 5); for dwellings with garages, Subsection D(1) shall apply. Lot must have at least 32 feet of frontage along the road right-of-way. Two driveway accesses (curb cuts), not exceeding nine feet each in depressed width, may be permitted. The driveways must be positioned so that the distance from the edge of the driveway to the nearest side property line meets the side yard setback requirements of the zoning district in which the subject lot is located. No driveway depression shall be permitted within 25 feet of the established curbline of an intersecting street. For corner properties, the two driveway accesses must be along the same street. The required number of off-street parking spaces shall be provided in accordance with § 102-118.6A. Limiting parking of certain vehicles on public and private property. Notwithstanding anything contained in this chapter to the contrary, no more than one vehicle, as hereinafter defined, may be parked on private or public property in the City of Ventnor City by any owner or lessor thereof. Length: 19 feet from the outside of the front bumper to the outside of the rear bumper. Width: seven feet six inches from one side wall to the other side wall measured at the widest point of said vehicle. Height: eight feet six inches from the street to the uppermost point of said vehicle when tires are fully inflated. Weight: not exceeding 10,000 pounds. "Vehicle," as defined herein, shall include any vehicle meeting the above description and shall specifically include but not be limited to trucks, jitneys, trailers, tractor trailers and autobuses. Any vehicle may be serviced at a legal service station in the City of Ventnor City, so long as said vehicle does not obstruct access by other vehicles into or within the site and is not parked in any sight triangle which would obscure the view of any motorist at any intersection or other portion of any street within the City of Ventnor City. Vehicles as described herein may be so parked at legal service stations only for the purpose of having the same serviced by the staff located at said legal service station. Any vehicle shall be permitted to park within a legal four-sided, totally enclosed garage structure. Vehicles providing the delivery of goods or services may be parked in legal parking spaces for said purpose of providing the service or delivery of goods and shall be so parked only as long as it is necessary to complete such delivery. This exception shall include the parking of vehicles at business establishments during the normal hours of operation, if the same are legally parked and meet all other time restrictions imposed by the Code of the City of Ventnor City. Vehicles associated with a particular legal business establishment in any commercial district in the City of Ventnor City may park in legal off-street parking spaces of that particular business establishment after normal hours of operation in said commercial district. Any vehicles of a public bus company are exempt from the restrictions contained in this subsection of the Code of the City of Ventnor City if the same are parked within a legal turnaround area or other legally permissible waiting zone and are temporarily stopped before continuing their designated route. Vehicles of the City of Ventnor City are exempt from the regulations contained in this subsection, including police vehicles, fire vehicles, public works vehicles and any and all other vehicles used by the City of Ventnor, County of Atlantic or other public bodies which are being used to fulfill a legitimate governmental or public function. Vehicles of certain utility companies are exempt from the restrictions contained in this subsection of the Code of the City of Ventnor City, including vehicles used by Atlantic Electric, South Jersey Gas Company, New Jersey Bell and other such utilities, as long as the same are being used in the City of Ventnor City to fulfill legitimate governmental or public functions. Vehicles used at construction sites are exempt from the provisions of this subsection as long as the same are parked at said construction site and may be parked at said construction site only during the time period of any day when work is actually being performed at said construction site. Any vehicle restricted by this subsection of the Code of the City of Ventnor City is exempt from said restrictions and may park on public or private property within 500 feet of the home that is owned or leased by the operator of said vehicle for any one-hour period during each day if said vehicle is parked while the operator thereof is in said home for personal reasons, such as eating lunch, picking up personal items, etc., but in no event shall any such vehicle be allowed to be parked for said one-hour period for the purpose of repairing said vehicle, changing oil or otherwise servicing said vehicle. Any vehicle legally parked in the City of Ventnor City pursuant to this subsection must still receive an appropriate resident parking sticker and must otherwise comply with all statutes, law and ordinances of the State of New Jersey, County of Atlantic and City of Ventnor City. No vehicle parked on streets for public sale. No automobile, truck or any other vehicle of any type may be parked in any street, alley, cul-de-sac or other public place within the City of Ventnor City when said vehicle is being advertised by a for-sale sign in, on or in any way attached to said vehicle advertising the same for sale. The following signs shall be permitted anywhere within the City limits. Official traffic signs and any other sign required by law. The size of said sign shall not exceed eight square feet. Not more than one sign shall be erected for any one property. Signs bearing the words "Sold" or "Rented" shall be removed 30 days after being posted. Such signs shall be erected only on the premises to which they relate. The size of such sign shall not exceed 20 square feet. Such sign shall be located within the boundaries of such development. Not more than one such sign shall be placed within any such development, unless the development fronts on more than one street, in which case one such sign may be erected on each street frontage. Not be greater in area than 12 square feet. Not exceed the permitted height of five feet. Be constructed of natural materials. The size of such sign shall not exceed an area of one square foot for each two feet in width of the front of the building or portion thereof devoted to such use or activity. Such sign shall be erected only on such premises on which the use to which the sign relates is conducted. Said sign shall be mounted on the surface of the structure to which it is appurtenant. Such sign shall not contain information other than the name and logo of the project. The size of such sign shall not exceed 16 square feet in area and five feet in height. Such sign shall not exceed two feet in height. Such sign shall not be located or project above the roofline or more than 10 inches beyond the front wall of any structure. Such sign is mounted flat to the building at a height at least 10 feet above sidewalk grade and not more than 15 feet above sidewalk grade. Temporary banner signs may be permitted, provided that a banner permit is obtained, the cost of which is $5. The banner permit will be issued for a period of 30 days. A limit of two banner permits per year will be issued for each commercially-owned property. The banner must be mounted flat to the building facade, and the banner size cannot exceed 25% of the building facade. The identification sign is located within property line. In addition to the brand sign, one special sign not exceeding 12 square feet in area may be displayed. Marina commercial signs, provided that the sign does not exceed 20 square feet in area and there is one sign identifying the business establishment. One sign per property, two if the property is situated on a corner. The size of the sign shall not exceed four square feet in area (two by two feet). Signs shall be located no closer than five feet to a property line. Such signs may be erected no earlier than 30 days prior to an election and removed no later than one week after the election. Not exceed the permitted height of 25 feet. Not be greater in total area than 100 square feet. Be set back from the street right-of-way a minimum of 25 feet. Be landscaped at its base and maintained. Be constructed of natural materials and have an external light source and have no moving or flashing parts. Be kept in good repair. Be designed within an overall theme for the center. Not exceed 5% of the individual establishment's facade. Have no moving or flashing parts and have an external light source. Signs within windows of individual shops shall not, in the aggregate, exceed 20% of the total window area. Advertise only the business conducted on the property. Be attached to the building's facade. Not exceed 5% of the facade area and in no case be over 100 square feet. Have no moving or flashing parts. Automobile sales and service establishment window signs shall not, in the aggregate, exceed 20% of the total window area. One principal building or porch mounted sign at the first floor level which shall face the street and not exceed 16 inches in height and 24 inches in width. Signs shall be made of wood or metal with raised or embedded lettering. Sign color shall be limited to cranberry red, blue or white, or a combination of same. In addition, lettering may be black or gold. In addition to the building-mounted sign, one sign hung from an existing or proposed light pole not exceeding 10 inches in height and 16 inches in width, two-sided, of cast metal or wood, white lettering on a black background. Each sign may be lighted by a covered overhead fluorescent light not exceeding 40 watts. One bulletin board/identification sign, either building-mounted or freestanding, not greater than four feet wide and five feet high, internally lit. If freestanding, the sign cannot be placed higher than 18 inches above existing grade and not closer than four feet to any property line. One freestanding changeable message center sign, internally lit, not greater than six feet in width and four feet in height with four-inch maximum high lettering. The sign shall not be located closer than two feet to any property line. The bottom of the sign shall not be placed higher than 18 inches above existing grade. Minimum setback: 10 feet from all lot lines. Maximum height: 10 feet to the top of the sign face, excluding architectural elements. Total height shall not exceed 15 feet. Maximum gross surface area of signs permitted: 24 square feet (total one side). No freestanding sign shall have more than two faces. Permitted freestanding signs which utilize digital display technology may dedicate up to 100% of the permitted sign area to the digital display portion of the sign. Daytime (dawn to dusk): 5,000 candelas per square meter. Nighttime (dusk to dawn): 150 candelas per square meter. Maximum luminance. No digital display sign may exceed 0.1 footcandle (1.07 lumens per square meter) at the property line where the sign is located. The digital display portion of a sign shall change messages at intervals of no less than three minutes. The digital display portion of any sign may only advertise businesses, organizations, or facilities located on the site, products or services offered by those businesses/organizations/facilities, public service announcements approved by the City of Ventnor, or urgent public safety messages approved by the City of Ventnor Police Department. Illumination related to any sign may not create a luminance greater than 0.1 footcandle at any property line. Such signs shall be erected only on the property where such work is being performed. The size of such signs shall not exceed four square feet. Such signs shall not be placed before the work commences and shall be removed within one week of completion of work. At no time shall there be more than one temporary sign permitted on the property regardless of the number of trades performing work. A sign plan shall be submitted that demonstrates a coordination of signs and graphics for site plan review. The plan shall include details on letter style, lighting, color, construction and materials and location. The sign plan shall be based on an integrated design theme and shall be designed so as to be in harmony and consistent with each other and the design of the proposed development. No sign shall project over any sidewalk nor extend beyond any property line. Signs shall have no moving parts or flashing effect and shall have an external light source designed so as to prevent glare. Window signs may be used, provided that the area does not exceed 15% of the total window area and the total sign area does not exceed the standards for the individual use. Awning signs and awnings may be used, provided that the lettering appears on the vertical front or side flaps and that no part of the lettering is greater than 10 inches in height. Also, the awning must not protrude greater than six feet from the building and the main support frame must be at a height of six feet eight inches above sidewalk grade. The painting of signs directly on a wall, window or other portion of a building is prohibited. Editor's Note: Former Subsection G, dealing with banner signs, was repealed 11-21-1991 by Ord. No. 9126, and former Subsection H was relettered to Subsection G.
For all users within the City, adequate lighting shall be provided to ensure safe pedestrian and vehicular travel. The adequacy of lighting to provide safety shall be considered by the City Engineer and is subject to approval during site plan review. Lights shall be directed and designed so as to prevent glare beyond property lines. The maximum height of freestanding light standards shall be 25 feet, and their bases shall be landscaped and maintained. Standards will be set back a minimum of 30 feet from the street right-of-way where possible. Parking areas: an average of 1.5 footcandles throughout. Maximum at property lines: 1.0 footcandle. The regulations contained herein shall apply to solar energy systems intended for the provision of the electrical energy needs of the owner/operator of the system and/or the property on which the solar energy system is situated and not for the generation of electricity for commercial purposes for resale, except that excess electricity not utilized for the use on the lot whereon said system is located may be introduced into the energy grid for credit under New Jersey's Net Metering and Interconnection Standards pursuant to N.J.A.C. 14:4-9. This section shall apply to roof-mounted solar energy systems only. Pole, tower or ground-mounted solar energy systems of any size shall require minor site plan approval pursuant to Article XIX of this chapter. Solar energy systems shall only be permitted as indicated in §§ 102-12 through 102-111. All solar energy systems shall require a zoning permit from the Zoning Officer and a building permit from the Construction Code Official prior to installation. Applications for a solar energy system shall include information demonstrating compliance with the provisions of this section. Approvals under Subsection C(1) shall apply to solar energy systems intended for use as detailed under § 102-118.9A. Solar energy systems not intended for use as detailed under § 102-118.9A(1) shall require approval by the Planning Board or Zoning Board of Adjustment, as the case may be. Solar energy systems not in conformance with any of the following regulations shall require variance approval by the Planning Board or Zoning Board of Adjustment. Submission requirements and procedures for zoning permit. Applications for a solar energy system shall be submitted to the Zoning Officer in accordance with §§ 102-119 through 102-129. Locations, dimensions (including height) and types of existing major structures on the property. A sketch plan or survey which shall accurately depict the locations, dimensions and type of solar energy system proposed. All rights-of-way contiguous with the subject property. Manufacturer specifications and/or "cut sheets" of the proposed solar energy system, certified by a New Jersey licensed professional engineer, including manufacturer and model. Notification of utility company for interconnection purposes. Applications for zoning permits for solar energy systems shall be accompanied by the required fee pursuant to § 102-160. The Zoning Officer shall review the application in accordance with § 102-147 and shall issue or deny an application for a zoning permit for a solar energy system within 10 days of the date on which the application is received. Once a zoning permit for a solar energy system is received, the applicant shall apply for a building permit under the rules, regulations and procedures established under N.J.A.C. 5:23. The solar energy system is out of service or otherwise unused for a continuous twelve-month period. Solar panels shall be permitted as a rooftop installation where permitted under §§ 102-119 through 102-129. The structural, electrical and other pertinent elements of any solar energy system shall be designed by a New Jersey licensed professional engineer. Such design(s) shall be signed and sealed by said engineer, certifying that the design complies with all of the standards set forth for safety and stability in all applicable codes then in effect in the State of New Jersey as well as all provisions of this section. Solar panels shall not exceed a height of 12 inches from the surface of the roof on which they are affixed. In no event shall the rooftop placement of solar panels result in a total height, as defined in § 102-11, greater than 12 inches from the maximum building height for a principal building permitted in the zoning district in which they are located. Solar panels installed in a rooftop configuration shall be installed within the actual boundaries or edges of the roof area and cannot overhang any portion of the edge of roof. Installations must not interfere with any operation of any fixture protruding from the rooftop level as required by the International Building Code or other applicable codes. With the exception of the manufacturer's or installer's identification, appropriate warning signs and owner identification, no signage shall be posted, attached, affixed or otherwise installed on any component of a solar energy system. In no case shall any of the aforementioned permitted exceptions be visible from any property line. Ground-based interconnection cabinets and other mechanical equipment associated with and necessary for the operation of a solar energy system shall conform with all setback and coverage requirements for accessory structures in the zoning district where they are located. Such cabinets shall not exceed 120 square feet in area nor eight feet in height and shall be equipped with a lock. In addition to City approvals required under this chapter, the property owner/installer of the solar energy system must receive approvals from any outside agencies having jurisdiction over such systems prior to the installation. Solar energy systems that connect to the electric utility shall comply with New Jersey's Net Metering and Interconnection Standards for Class I renewable energy systems pursuant to N.J.A.C. 14:4-9. A minimum of one "High Voltage" placard shall be posted at or near ground level. Emergency and normal shutdown procedures. Similar signage shall be placed on the outside of the building, near the electrical meter, where an interconnection cabinet is located on the inside of a structure. The Atlantic City Electric Company, its successors and assigns, and/or as designated by state authority, shall be notified, in writing, of any proposed interface to that company's grid prior to installation of a solar energy system and shall conform to any legislated requirements governing installations of solar energy systems so as to comply with the utility tariff specifications. Evidence of such notification shall be submitted to the City at time of application. Solar energy systems shall be constructed in accordance with the appropriate sections of the International Building Code and any future amendments and/or revisions thereto. The installation of a solar energy system shall conform to the National Electric Code and shall be subject to, in perpetuity, any and all requirements for interconnection of the Atlantic City Electric Company, its successors and assigns, and/or as designated by state authority. Wires and cables at ground level shall be properly installed underground in accordance with the International Building Code. Wires and cables on a structure shall be properly installed so as to be hidden from view or otherwise treated in as aesthetically a manner as possible. It is unlawful for any person to construct, install or operate a solar energy system other than in compliance with this section. Solar energy systems installed prior to the adoption of this chapter are exempt from the requirements of this subsection. Any person who fails to comply with any provision of this section shall be subject to enforcement and penalties as stipulated in § 102-153. The approval of a solar energy system shall not create any actual or inferred solar energy system easement against adjacent property and/or structure. The owner/operator of a solar energy system shall not infer or claim any rights to protective writs to any caused shadows or operating ineffectiveness against future development adjacent to, higher than or otherwise impacting the subject solar energy system. The approval of any solar energy system granted under this subsection shall not create any future liability or infer any vested rights to the owner and/or operator of the solar energy system on the part of the City or by any other officer or employee thereof or any future claims against such approval that result from reliance on this subsection or any administrative decision lawfully made thereunder.